In this interview, Paulina Schwaner, an IFAD consultant and former Chilean journalist, speaks with Carlos Meléndez, 28, a dairy and vegetable farmer from Venezuela. Meléndez began raising his own animals and growing vegetables around the age of 16. After several failed attempts, he finally managed to hit his stride. 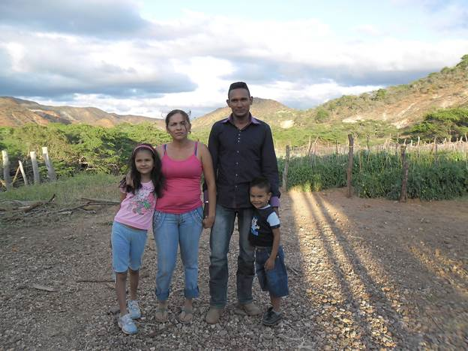 Meléndez has now become a successful dairy and vegetable producer in his rural community in north-east Venezuela. Q: Carlos, you began working in agriculture when you were very young. You are now a successful rural entrepreneur and a community leader. How would you describe your journey? Q: You had a vision, you dug and you found water. How important is water for your community? How do you address the challenges of water scarcity? “Water and soil are two essential elements for life, without them one cannot work to produce food. In my village in Venezuela, as well as in the rest of the world, we are going through a difficult moment as the water is getting more and more scarce and it is harder to find. Five years ago, I dug a bore well with my own hands. Q: How did you face the issues that were challenging your work? What kind of support did you receive? Q: As a young entrepreneur and community leader, what do you think is the biggest potential that young people possess? What kind of advice would you give to rural youth? Q: How, in your opinion, could governments and development agencies alike support rural youth? “Governments should create more institutions that take into account the needs of young entrepreneurs. For example, here in Venezuela, the IFAD-supported Sustainable Rural Development Project for Food Security in the Semiarid Zones of Lara and Falcon States (PROSALAFA III) project has helped me a lot through capacity building and workshops on animal rearing. Q: Your experience in agriculture has been quite positive, however, some young people have a negative outlook on agriculture. How could we make agriculture and rural life more attractive for those youth? Q: What are the challenges that you see yourself facing in the future, both as an individual and as part of a community?